Ben spoke candidly about his experience of being in care, after he was abandoned by his mother at the age of ten. Ben and his brother were separated from their sister and placed in a children’s home, where he noticed a “stark change in behaviour immediately”. Within weeks Ben was arrested and spent the night alone in a police cell. The care system had done him “a lot of damage in a short amount of time”, he said. Ben described his spiral downwards into a life of drink, drugs and self-harm, which he said was “anarchic at times”. He was moved a total of 51 times during his years in the care system and, like many young people with broken family ties, he ended up in a young offenders’ institution. Ben’s “light-bulb moment” arrived after he was sentenced to a 16-month sentence for robbery as a teenager, when he decided he didn’t want to spend any more time locked up. Ben later began volunteering for UserVoice, a charity led by ex-offenders which aims to reduce re-offending, and he eventually published a book about his experience of the care system, Fifty-one moves. Ben is now an intensive support worker in a specialist mobile provision for looked after children and young people with complex and challenging behaviour. He commented that the government’s Staying Put policy - which enables children in foster care to remain with their carers until they are 21 - although a welcome change, excludes “9% of the most vulnerable and disadvantaged young people in the country” – those in residential care. Ben is calling for the Staying Put policy to be extended to children in residential care and has leant his support to the Every Child Leaving Care Matters campaign. When asked for his view on the main failings of the care system, Ben said that the lack of stability was the key issue. Professionals looking after children in care should have the requisite skills to look after “damaged young people”; be prepared to “stick with them through the bad times”, and should not “phone the police at the first sight of bad behaviour” from a young person. “We need to find the right provision to meet young people’s individual needs,” he concluded. “Not move them to another placement because a space has become available”. 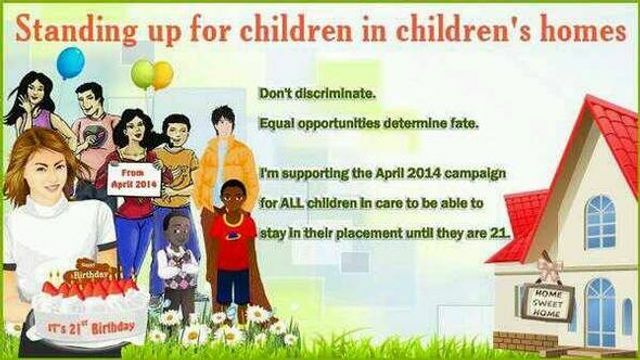 You can sign the Every Child Leaving Care Matters petition here. We ask that the government stop discrimination against children in residential children's homes and support all children and young people in care to 21 years of age. Children in foster homes can now stay until they are 21. We ask all those who share our view to support our campaign for equality.